It is important to replace missing teeth for proper chewing of food, jaw support, stability of the remaining teeth, and an attractive smile. Missing teeth disrupts proper function and the teeth next to and above the missing tooth/teeth will shift, move, and tip into the space in time. It is much easier to restore a missing tooth soon after it is lost than waiting a number of years after teeth have shifted significantly. A dentist or prosthodontist can determine the best method to replace your missing tooth or teeth. Missing teeth are replace through removable partial dentures, fixed dental prostheses (“bridges”), or dental implants. A discussion with your dentist would help in determining which option is right for you. How Are Dental Implants Made? The loss of one or more teeth is no small matter. In addition to the cosmetic effects of a missing tooth, there are serious health concerns that accompany the loss of a natural tooth. The most serious concern is bone loss, which becomes pronounced over time and can lead to the loss of more teeth and gum disease. To avoid these negative outcomes, many dental professionals recommend dental implants as a replacement for natural teeth. Dental implants have either two or three parts. The implant itself is a small post that is made of titanium. This post is either cylindrical in form or slightly tapered depending on the type of implant chosen by your dentist. The implant is surgically inserted into the jawbone. At this point, the patient is sent home to heal, during which time the implant will fuse to the bone. Once that process is complete, the post will provide a strong foundation for the replacement tooth or teeth. The patient returns to the office for the next step. An abutment is then attached to the implant. This is the “connector” that will allow the replacement tooth to be secured to the post. The replacement tooth, called the crown, is custom made to match the patient’s own teeth. At Worthington Dental Group, we have our own on-site dental lab where we produce our patients’ crowns. This allows us to control the design and fabrication of the crown to perfectly match your teeth. The short answer: it depends. The initial appointment and evaluation take very little time, and the Worthington Dental Group team can schedule the remaining appointments to suit your schedule. Each individual is unique, and it can take anywhere from a few weeks to a few months for the implant to properly fuse with the patient’s bone. From that point forward, attaching the crown is a fairly straightforward procedure. 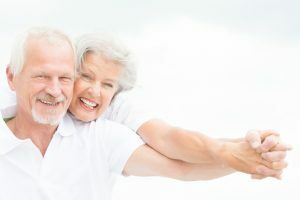 Dental implant treatment costs is similar to traditional bridgework, which was once the only option for individuals who had only a few missing teeth. However, bridgework can fail over time and can also cause damage to surrounding teeth. In the end, addressing those issues can be far more expensive than dental implants. At Worthington Dental Group, we strive to take care of all of your dental needs in one location. We have excellent prosthodontists who complete the restorative portion of the implant procedure. We also have other dental specialists to take care of all of your dental needs and rarely refer patients to another dental office for treatment. We welcome new patients and look forward to meeting you and your family.